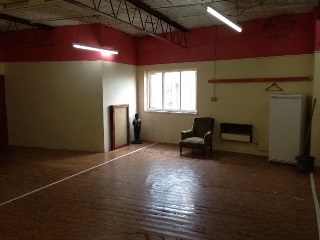 Post your Theatre Performance / Rehearsal space for Hire - Wanted / Available. 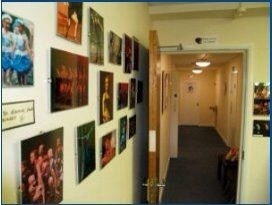 Please mention dramagroups.com when replying to Theatre Performance / Rehearsal space for Hire Notices. 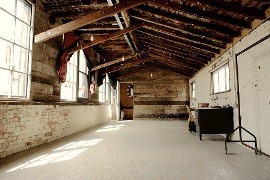 369 film studios Leicester has space for hire only £29 per hour. 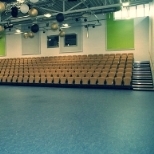 Aspley Community and Training Centre has a theatre with full lighting rig, Sound System and curtains that can close around the whole of the room. We are looking for groups that are interested in hiring the room, or making it a home. 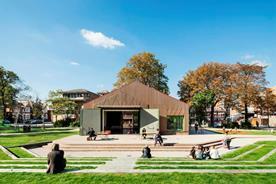 This is an exciting venue called ARC House which is located near Harrow on the Hill Metropolitan train station. There is a magnificent outdoor performance space with stage, lighting and sound equipment which would be the ideal space for theatrical and dance performances. The function room is also available for private hire for birthday parties, conferences, business meetings, dance/fitness classes and charity events. It is an ideal venue for you and your business and will provide you with an excellent opportunity to showcase your business and talents in Harrow. 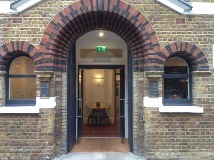 ARC House is only 100 meters from Harrow on The Hill train station. It boasts a café that serves delicious food and drink. It is the perfect place to rest your feet and unwind. For more information, please visit our website at www.harrowcommercialservices.co.uk or you can call us on 020 8736 6810 where we will be happy to assist you. Our city-centre Studio is the perfect place for you to stage your services! 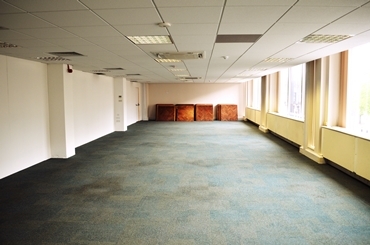 160m2 of prime city-centre space available for hire! Finding the perfect place to rehearse in can be tricky and time consuming! Thinking of adding more classes to your school's timetable but can't seem to find the right spot? Situated in the heart of the City Centre, Aurora Studios is easily accessible and has the entire working population of Belfast right on our doorstep! Our studio is bright, airy and spacious. 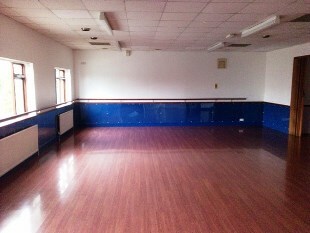 Designed to be used and loved, the ideal place for dance and drama classes, rehearsal space or group activities! 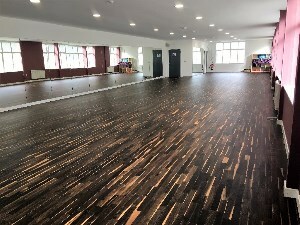 Our large spacious studio is built with fully mirrored walls, ample windows for natural light, and a beautiful black oak sprung wooden dance floor. Portable ballet barres, a built in sound system, yoga mats and more. 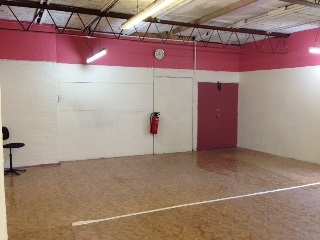 Possibilities for use of our studio are endless! In Belfast City Centre Aurora Studios is the perfect meeting spot for your customers or team! The press has been raving about us, so why not take an opportunity to be part of Belfast's newest Hot Spot! 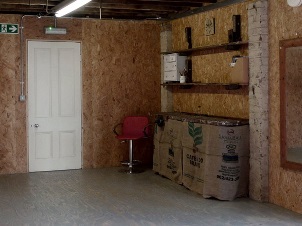 Capacity: Workshop (40), Theatre (50), Reception (60). Access: Cardboard Citizens building is fully accessible. Copperdollar Studios are two unique studios situated in the heart of Brighton’s Kemptown on the East Sussex coast. They are available to be hired by the creative community of Brighton and beyond. They are popular with photographers and videographers because of their rustic walls, wooden floors and variation of textured aesthetics that create a rich choice for backdrops. Theatre companies and musicians who need a quiet yet rich shabby chic atmospheric for music videos and band shoots make use of the space, too. They are available from 8am to 10pm, 7 days a week. 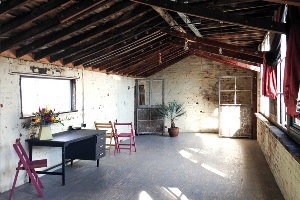 Although we can't accept regular small slot bookings, both of the studios can be block booked or rented as a one off which makes them perfect for summer programmes, workshops and training. The booking rate is reduced by 50% for students. 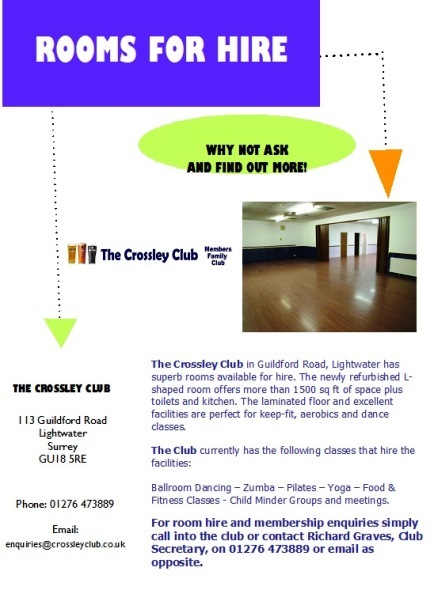 Crossley Club in Lightwater is a fantastic village venue, ideal for touring theatre or small productions - we would welcome amateur dramatic groups to use our facilities to host their plays and training/rehearsal. We have a downstairs main area with stage and PA system, and an upstairs dance studio that can be used for a variety of requirements. Available for HireAny day, enquire for availability. Full access available on Mondays when building is closed. Located on Stratford’s High Street, Discover Children’s Story Centre is a unique and exciting venue offering versatile and affordable spaces for meetings, away days and rehearsals. 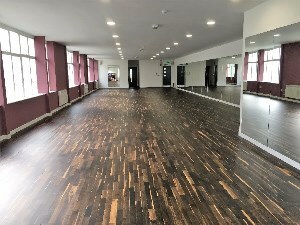 There are a number of rooms available, the most popular for rehearsals being The Studio, which is a black box space with integrated lighting rig and sound system. 120m2 space 15m x 8m wide. 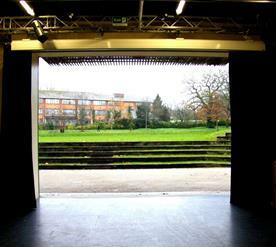 The Studio is a large white box space with black out blinds, lighting and sound system available as an optional extra. 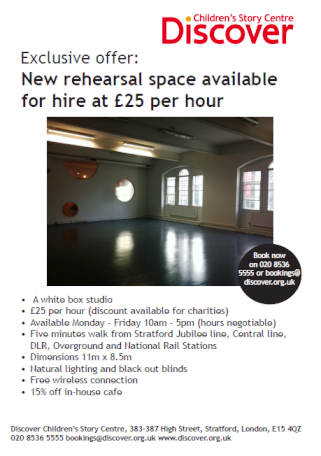 An excellent rehearsal space with a discount for organisations using it for this purpose. It is also suited to meetings exhibitions and events. 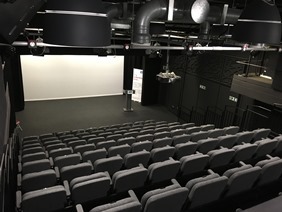 This space can accommodate 100 people for a launch or event 60-70 lecture style or is suited to smaller seminars and break out groups. We rent out our studios for various classes/events and groups throughout the week. We are based just outside Liverpool city centre L3 8HA and have 3 studios available to hire out all with sprung floors and mirrors. 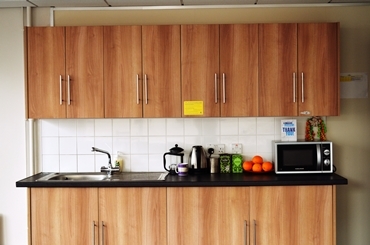 We also have kitchen facilities for use and receptionist on the door at all time to assist with anything. Music, band and solo practice. Recording services. Small drama group rehearsals. 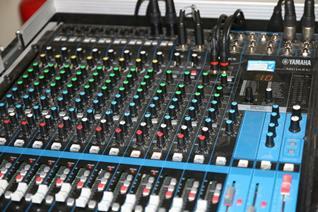 We are a rehearsal and recording facility with two rooms available for hire. Rooms are approximately 35sq metres. Equipt with PA and microphones, portable seating. Completely soundproof. Kitchen and toilet facilities available. Car parking. Free wi-fi access. 7 days a week 10am - 6pm Evenings possible if block booking days. This is suitable for amall groups or individual use. Parking opposite in CO-OP car park 2 hrs free. 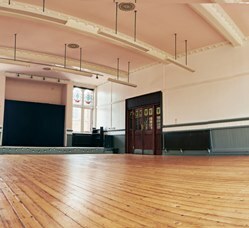 Large, bright, airy studio space in central Newcastle for hire, perfect for rehearsal, workshops, meetings and work-in-progress showings. We are a company called Grosvenor Casino Reading South. We are more than just a casino but an entertainment venue. Please have a look at our beautiful showbar. If you are looking for a place to perform on weekdays, we are a perfect venue for that. Our capacity is 150 people in theater style. Should you require any further assistance, please do not hesitate to contact us! 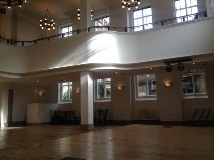 Please see our venue hire webpage, however as I mentioned you will get it for free. I would like to introduce our recently refurbished venue Hanbury Hall. 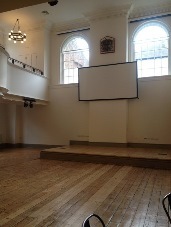 I am sure you are always on the lookout for new spaces to hold your performances and Hanbury Hall is a fantastic hidden gem in the heart of Spitalfields. 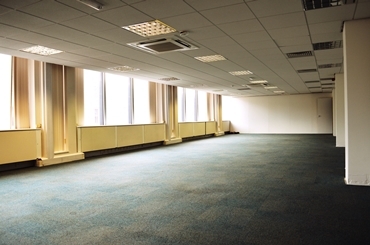 Are you looking for cheap room hire in Birmingham? 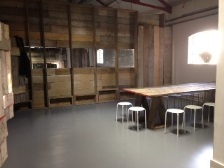 Do you need a space to hold a meeting or training sessions or even a rehearsal/workshop? 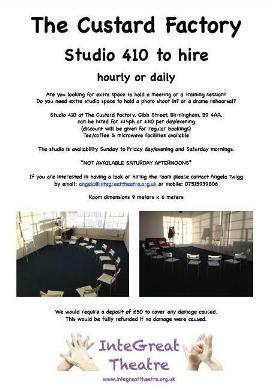 We have a lovely studio/room at The Custard Factory in Birmingham. 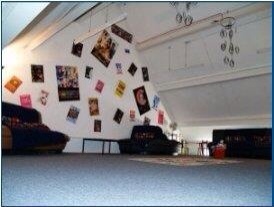 The room is 9meters by 6 meters. Facilities available: Tea/Coffee/Microwave. Chairs and tables. Flip chart and white board. Stereo and speakers to attach to an ipod. 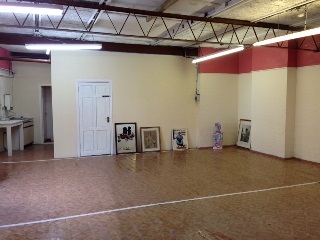 I have an open space available in the jewellery Quarter Birmingham on Kenyon Street. It is open square space with toilet and kitchen facility. It would suit any fitness yoga or drama style classes. Competitive rates and day rates also available. I manage a newly refurbished theatre called the John Lyon’s Theatre located in the heart of London, between Covent Garden and Holborn. 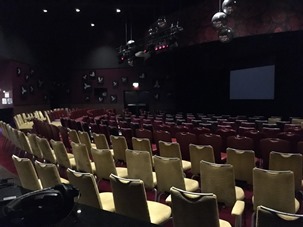 The space can accommodate up to 110 people for stand up reception styled events, 100 people theatre style on retractable seating or 80 people cabaret style. Our multifaceted, fully accessible theatre is the ideal space for product launches, AGMs, concerts, company presentations, theatre productions, rehearsals, award ceremonies and lectures. 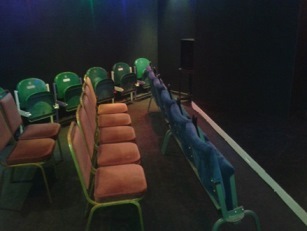 The theatre is available for private hire during the day or evening on a day/half day rate. Please see below for our venue page. Space dimensions: 9.158m wide (narrowing to 8.93m at the stage) x 13.1m long x 5.4 m high. The rig height is 4.4m. Floor space 119m sq. 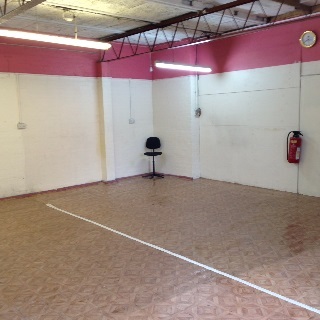 Available for any groups that would like to rehearse in it or have it as a permanent location. 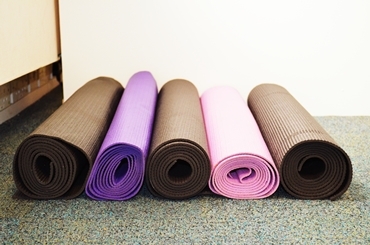 We have an extensive range of facilities for clubs, groups and classes. I am a Governor at Leavesden Green school in Watford, which you may know is near the Warner Bros Studios and just off the A406 so very handy for the M1 and M25 and of course Watford (we are on the number 10 bus route) Our school has some fantastic spaces that we know we can make better use of to generate some extra revenue to continue to make Leavesden Green the best place for our children to learn and grow. 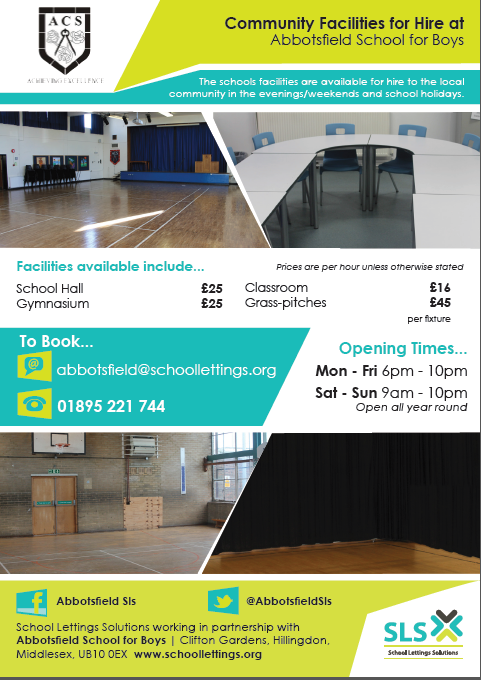 For example we have two large school halls which would be perfect for theatre groups - one has a large stage We are offering each space for £10 per hour/ £50 all day for community groups and £15/£75 for commercial ventures. They are available after 4pm weekdays, all day on weekends and school holidays Full details including a brochure can be obtained from Jo Rogers in the School Office by email to admin@leavesden.herts.sch.uk or by calling 01923 484340. 'Moseley School are delighted to announce the opening of their brand new sports complex in January 2015. As well as offering a range of sporting activities the stunning new build also houses a 350 tiered seating area with professional level lighting rigs all perfect for your performance whether big or small. The facility has ample parking and extremely good public transport links due to its position just outside Birmingham city centre. The futuristic and aesthetically impressive new build is sure to make a distinct impression on all visitors whilst providing a secure and well managed environment to house your production. What's more, we're more affordable than you think! We understand the financial pressures that all drama and dance groups face in these difficult times and will endeavour to house your performance at a price that means you've still got enough left in the coffers to go that extra mile on the main event...your performance! 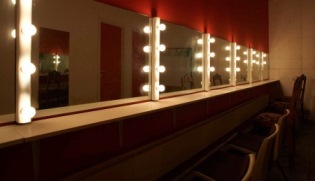 What's more we have a fantastic mirrored dance studio available for regular bookings or one-off rehearsals. Studio 1 occupies the old concert hall of the former Midlands Institute for the Blind and it’s a turn-of-the-century architectural gem! With an original wooden floor, stained glass windows and oodles of natural light, Studio 1 is the perfect space to host a special event or make an oridinary event feel extra special. 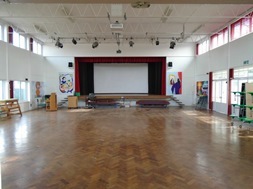 Facilities: Wooden floor, stage area (7.2m x 2.5m – 0.3m high), windows on two sides, sound system, 55 chairs, toasty heating, large projection screen. Rehearsals (discount for bookings of 3 days or more). Presentation evenings and large networking events. Meetings. Practical workshops and skill shares. Performances, cabaret and gigs. Private parties, children’s birthdays, events and celebrations. 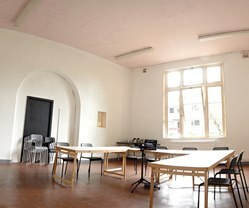 Facilities: Dance floor, chalkboard doors, meeting tables, 55 chairs, windows on one side, lovely heating. Meetings and seminars. Practical workshops and skill shares. Information events. Drop-in sessions. Small-scale rehearsals. Creative classes. Exhibtion and gallery space. Our newest studio space sits directly above Studio 1 but is a much more informal working environment. With views over most of central Nottingham, this studio, despite its size feels intimate and private – perfect for rehearsal periods and testing out ideas. Please note that Studio 3 is not accessible. 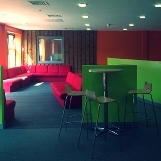 Facilities: Carpeted floor, 10 chairs, tables, sound system, uninterrupted views of Nottingham. Artists’ research and development processes. Rehearsals. Informal meetings. Or any kind of events. 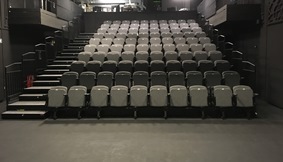 The drama theatre at OLSC measures 13x10m and is fully equipped with black-out curtains (or natural daylight if needed), lights (spots and lighting rig), a projector, a piano, a small movable stage and small kitchen area. 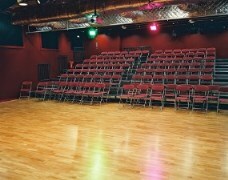 There is ample parking, with ground floor disabled access, making it the perfect drama space to hire in the Wolverhampton Area. 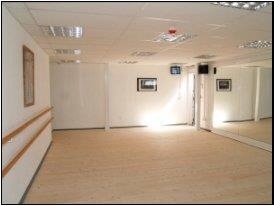 As well as being used by local drama clubs and organisations for practice and rehearsals the drama room it is also suitable for those looking to hire a small studio for band rehearsal, dance, aerobics or yoga. The Oh! Theatre is ideal for amateur dramatics including rehearsals. 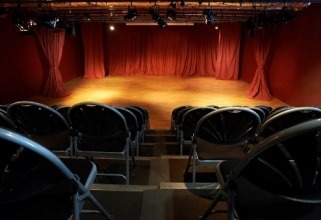 Our theatre space is available for performances as well as meeting and art events. Follow this link to a Google Street View for an side view of the theatre space. You need to move through the gallery to the bottom of the ramp and through the door! Height from ceiling to floor: 3.55metres/14feet. Height from light rigging to floor: 3.44metres / 34feet. Accommodates 120 seated (150 requested in advance), 80 seated at tables, 160 reception style. •	Adjacent bar area available for use as a food servery or for alcoholic/non-alcoholic bar. Large hall with stage along with two green rooms. 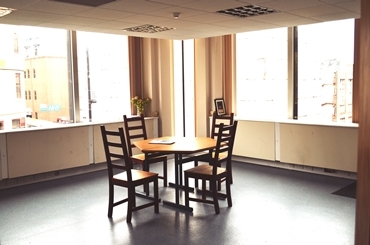 Coffee room, fitted carpet suitable for up to accommodating 40 people. Hosts monthly open night shows of live theatre, live music, live spoken word and media presentations. 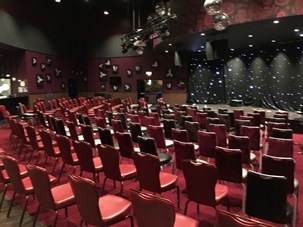 The venue, that is also available for other functions, comprises of its own theatre bar and 3 theatre studios, including a 23 seater theatre space with theatre lighting and PA.
We are a new Academy with a stage/hall for hire. We have just had full Theatre sound and lighting installed. Perfect venue for drama, music and dance. Please contact me if more information required. 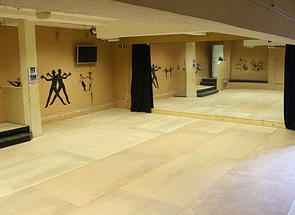 We have a venue that may be of interest to any groups that want to use it to rehearse or have it as a permanent venue. Are you planning an event and looking for a small, intimate yet functional theatre with full bar facilities, comfortable raised auditorium and full working stage with lighting and sound capabilities. Look no further. 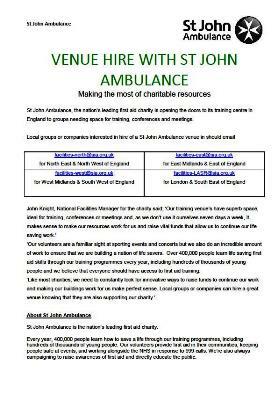 St John Ambulance, the nations leading first aid charity is opening the doors to its training centre in England to groups needing space for training, conferences and meetings. 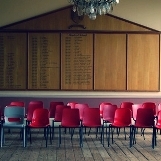 Our training venues have superb space, ideal for training, conferences or meetings and, as we don't use it ourselves seven days a week, it makes sense to make our resources work for us and raise vital funds that allow us to continue our life saving work. Tally Ho Conference & Banqueting Centre is situated in the heart of Birmingham with easy access from major motorways and Birmingham New Street Station. The suite of purposefully designed rooms can be tailored to suit all needs each posses the latest dedicated audiovisual technology coupled with virtually unlimited layout. All suites are situated on ground floor level allowing easy access for disabled guests and all benefit from natural daylight. The flexibility of the Centre, coupled with the expertise of our management team provides the ideal platform for a successful event, such as Business Meetings, Conferences, Exhibitions, Day Delegate Rates, Seminars, Outdoor Events, Lectures and Networking Events. We pride ourselves in providing a highly personal service from the moment you make your first initial enquiry through to the big day itself, enabling you to relax with complete peace of mind knowing that our professional team will be taking care of every detail. London’s new world-class production venue for theatre, music and live events. Dance Studio, Band Rehearsal, Dressing Rooms, Green Room, Bar Servery, CAD Suite, Recording Studio, Rehearsal Seminar Room, Sound Stage, Technical Workshop,Training Rooms, Workshop/Wet Room, Laundry Room, Production Office, etc. 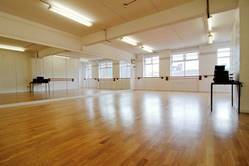 27ft 4" - 23ft 3"
This studio has windows, aircon, a smooth dance floor, a large mirror, easy access. Please contact 01322 272277 or email edge-arts@email.com for more information. A large studio complex in the West Hill area just 17 miles from central London. My name is Emma Killick, I am the principal of The Edge Dance and Theatre school Dartford. I have a large studio complex in the West Hill area just 17 miles from central London. 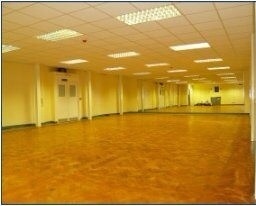 The complex if perfect or rehearsal space, auditioning, conference, competition space, parties, exams, meetings and more. My premises are equipped with two large mirrored studios, shower facilities, changing rooms, and a comfortable lounge area/waiting room with tea and coffee making facilities. I offer competitive rates and discount on group bookings or regular use. 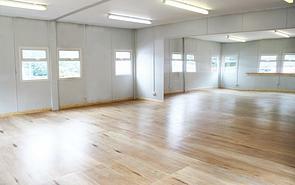 Studio 1 - 132 sq m- mirrored with full sound system and iPod doc. 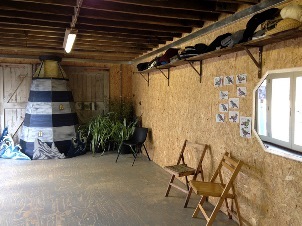 Studio 2 - 55 sq m- mirrored with full sound system and iPod doc. Louge area/waiting room-44 sq m-tv and tea/coffee making facilities. 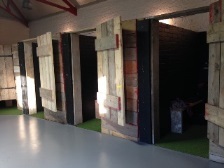 These fantastic facilities can be rented on an hourly rate or for a whole day. I represent The Grand Pavilion in Matlock Bath (www.thegrandpavilion.co.uk) which was bought from the council in 2013 by a charity run by local people keen to save and restore this historic building. It is a restoration project and all profits go back into the restoration fund. 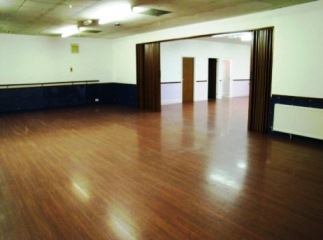 - Main Hall – very large room with bar and stage. Stage is 6’ high and has large wings left and right and there are 4 changing rooms underneath. Main hall seats up to 400 (flat). We also have 20’ wide staging at 2’high to use with the main stage or instead of the main stage. Local groups booking a room for a performance will get most of their rehearsal time free of charge. A brand new state of the art venue located in the heart of Southampton, bringing you the very best that the arts has to offer on the south coast. The Old Joint Stock Theatre has a variety of productions all year round, with a mix of in-house productions, co-productions and visiting companies. 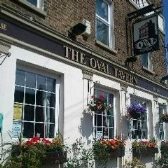 We want to challenge the constraints of a pub theatre space and use the venue to our advantage, but most of all, we want to bring challenging, quality work to maintstream audiences. The Spread Eagle Pub is opening a new 50 seat studio theatre. 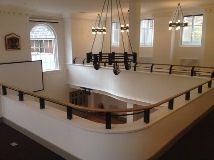 The theatre will open on the pub’s first floor where they already host film screenings. Fullers Brewery already has one pub and studio theatre, The Old Joint Stock, in Birmingham and they will be presenting a season of new work to celebrate the opening of The Spread Eagle Theatre. Tim Hodgson, Artistic Director of the Old Joint Stock Theatre Company says: "If this goes well, the Spread Eagle Theatre will launch as a permanent venue early in 2014, with a minimum of one week-long production each month, again strictly professional small productions, specialising in new writing. "We are really looking to get people in Croydon behind this new venture, especially given the dearth of arts venues in Croydon at the moment." Whether you are looking for a hall to host a bouncy castle party, go-kart party, football party, disco party or even a zorbing party, we have a whole host of halls, rooms and outdoor grounds to select from. 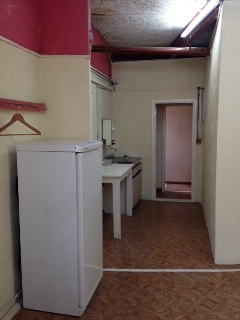 Access to a small kitchen area can be provided for tea/coffee making!! Tideswell Theatre was established in 2002 to bring great theatre, music, dance and comedy to the village. Run by Tideswell Community Players (performing plays since 1930) it is also a leading promoter for the rural touring scheme Live and Local. 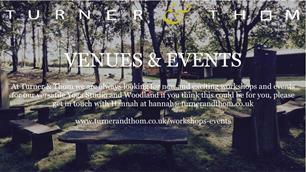 We are a company called Turner & Thom, based in Sandydown between Winchester and Stockbridge. We consist of a Lifestyle boutique where we sell Homewares, Glasswares, Toys, Clothes and much more. We are also home of Margaret Turner Fine Jewellery, a goldsmith who has built her company over the last 40 years. At the studio we also boast a Yoga studio where we host classes and workshops and a large woodland area where we will be hosting outdoor cinema events as well as other outdoor workshops. 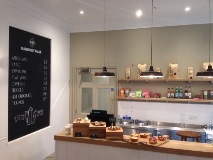 We are also in the process of opening our Kitchen Cafe where we will be offering Teas, Coffees and Food of the highest quality. Our Woodland space is an excellent venue for performing arts, we have had performances of Shakespeare’s Midsummers Night Dream performed by The Pantaloons and it was very well received here by the community. 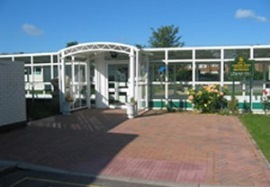 We have ample parking and can offer more hands to help with events if required. 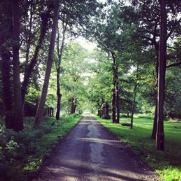 I have attached a photo of the woodland but we would be very happy for you to come and view the venue and get a real feel for it. Contact: If you think that this is something you may be interested in please get in touch with me by email cbeck@warrington.gov.uk, or by contacting me on 07970232658. I am based at Warrington Market and throughout the summer we are putting on events to help Promote the market. 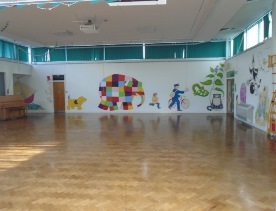 We have outdoor space that we are willing to offer to Play Groups, Dance Classes, crafts holiday clubs etc. for free to recruit new members or to promote yourselves within the town centre. We can also provide 2-3 Gazebos if needed. You are more than welcome to come and have a look at the space before you decide.